Captures the feel of the college jock scene better than anyone else has, but when it comes down to it, I just don’t love these guys. Still, there are some strong selling points. Everybody Wants Some!! is Richard Linklater’s self-described spiritual follow-up to his school’s-out classic “Dazed and Confused.” Only this time, instead of mixed cliques all the characters are good-looking jocks primed to beer blast, boogie woogie on the disco floor – and most importantly – shag some babes. 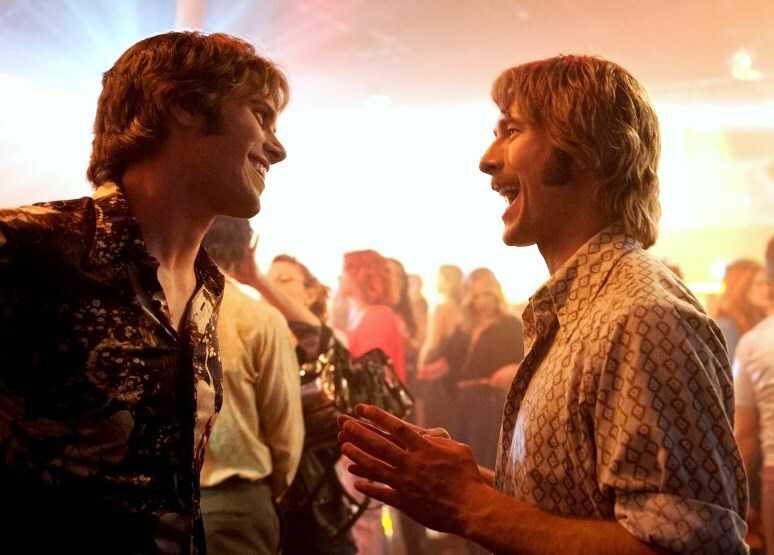 Linklater doesn’t think up plots, he tells stories. He certainly had stories to tell since his college baseball days before he cemented himself as a filmmaker, and chronicler of Texas. This is his story of qualifying vain horndogs that were looking to get laid a lot in 1980, because it must have been easier – freer, coming off of the liberal 1970’s – to get laid. The way these dudes fake sophistication and philosophical twaddle to get girls in bed irked me on a number of occasions, it’s all shallow macho technique (or perhaps I’m just jealous because I never got laid as much as these guys do). Huh, I’m starting to realize why I don’t love these guys. It’s not them, it’s me. Who are these girls? They’re mostly dumb, naïve girls who think they’re smart and hard-to-get. They’re eye candy. There’s some brief naughty T&A. Except there’s one smart gal, and that’s the one that freshman pitcher Jake (Blake Jenner) is after. This girl, a potential long-term sweetheart, is also kind of phony in her the-world-should-be-a-more-generous-place pronouncements. I get why Jake’s smitten with her, though, even though I’m not. Also, why is Jake so watchable as he is, though, considering that he’s just an unshaped freshman with not a significant lot of brains on him? Well, he’s kind of a cool, anything goes dude that just goes with the flow – and it helps that Linklater is so talented just getting the authenticity of his character, or any character, just right. As skeptical as I am for all the guy showboating, a few grew on me, mostly Glen Powell as a pick-up artist who tells the naked truth, and Wyatt Russell as a marijuana-high philosophizer and lover of “Twilight Zone” episodes. I also smiled big during any of the number of dance club scenes, particularly the country line dancing episode. Small scenes loom large in memory, such as when the most macho hitter on the team with the biggest mustache plays baseball with a machete. Or a scene of knuckle-flicking competition followed by stupid five-dollar bets. Really, though, you have to like movies that devote their time to locker room putdowns and listening to what guys really say when they hang with each other – I still know this, it’s the same in the 2010’s as it was 1980. I’m giving “Everybody Wants Some! !” three stars, even though I would say there’s no such thing as an unessential Richard Linklater movie. I just kind of feel though, that you have to be, 1.) in the mood for watching bad boys jiving in a freewheeling, do as they please environment, 2.) get it, it’s a hangout movie, smarter than most, but not a serious artistic statement, 3.) and ready to watch this probably just once. Maybe the three stars on the barometer still doesn’t make sense. I mean, is it better than most homogenized movie product in the 2012-2016 superhero crazed era where we get the same scenarios at the multiplex week in and week out? Yes, certainly. But for Linklater fans, this is a smaller lark than the rest of his work. Even though his smaller work is better than most of the rest of Hollywood’s. Film Cousins: “Breaking Away” (1979); “Dazed and Confused” (1993); “Bad News Bears” (2005); “22 Jump Street” (2014).